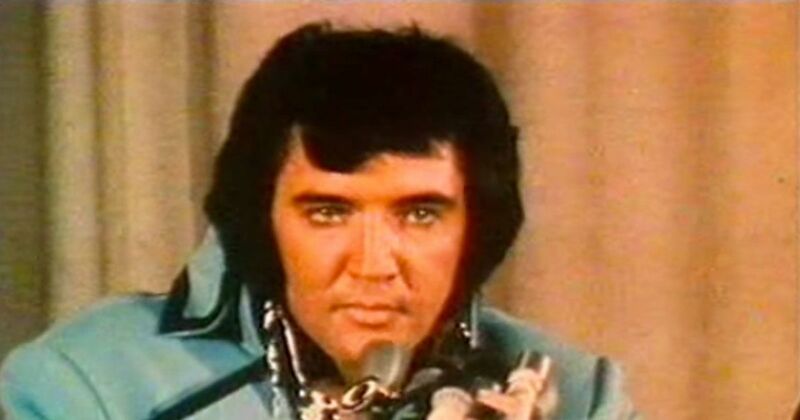 In this June 1972 Madison Square Garden news conference video, Elvis Presley shows his sense of humor and a bit of insight into his character. The media visit preceded his four night, sold-out concerts at the Garden where he performed before approximately 80,000 fans. During the media event, he mentions that he missed live audiences and therefore returned to performing after his movie roles. When asked if he was like his image, the "King of Rock and Roll" thoughtfully replied, "The image is one thing, the human being is another," he says. "It's very hard to live up to an image, let's put it that way." When asked another way if he was like his humble image, Presley caused laughter by standing and opening his jacket to show the extremely large gold belt he wore. Elvis protects his thought on the current news of the time by declining to comment on protests about the Vietnam War. When further pressed, the musician and actor stated that he was, " just an entertainer." While he didn't care to share his opinion, he said he didn't mind if other entertainers saw the need to comment on such topics. Another interesting detail in this video shows Presley's reaction when asked if his wife Priscilla was with him. The couple, who had privately separated months earlier, formally filed for separation the following month. The man sitting beside him was his father, Vernon Presley, who joined his son for the New York events.